The fire-bombing of Dresden was considered to be a gratuitous crime on the part of the British which caused up to 300,000 deaths. 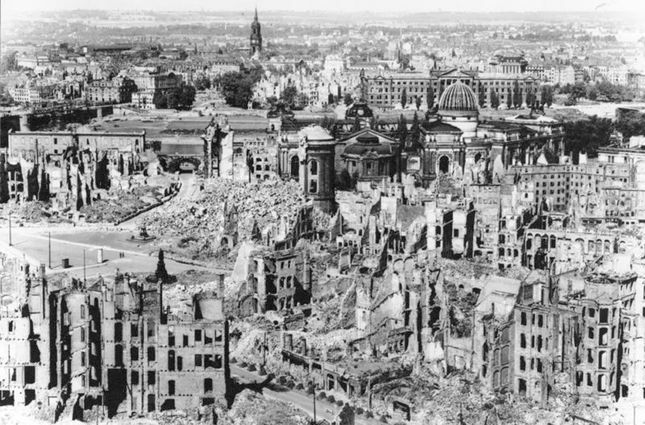 Dresden was almost completely defenseless against the Anglo-American terror-attacks, which allowed the bombers to descend to lower levels and to maintain a steady height and heading, making their bombs even more effective. Dresden had not previously been bombed during the war. The city was not considered a likely target because it was not a major contributor to the Nazi war economy and no key oil refineries or large armaments plants were located there. 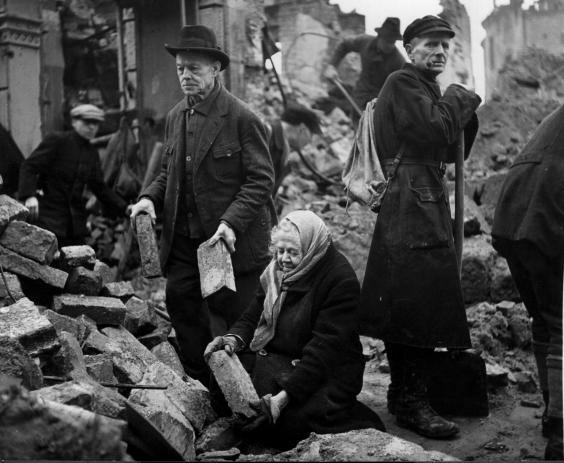 In the British Ministry of Economic Warfare’s 1943 “Bomber’s Baedeker,” Dresden was ranked 20th of 100 German towns in its importance to the German war effort. In fact, Dresden was best known worldwide as a site of architectural treasures and was sometimes referred to as the “German Florence.” Despite this, British Prime Minister Winston Churchill ordered the Dresden raids based on a plan submitted in August 1944 by Sir Charles Portal, Britain’s Chief of the Air Staff. Codenamed “Operation Thunderclap,” the plan involved concentrating an entire attack on a single big town other than Berlin to try to inflict a single major blow on Germany using all available power. Portal opted for the “area bombing” of a city because cities afforded a big target. In January 1945, Churchill approved Portal’s plan, specifically in regards to large cities in eastern Germany, and demanded immediate action. The next day Churchill was told that Dresden, Berlin, and two other cities would be attacked as soon as conditions allowed. Incendiaries were heavily used in the first three Dresden raids. Incendiary bombs are are explicitly designed to start fires; they were filled with highly combustible chemicals such as magnesium, phosphorus or petroleum jelly (napalm), in clusters over a specific target. After the area caught fire, the air above the bombed area, became extremely hot and rose rapidly. Cold air then rushed in at ground level from the outside and people were sucked into the fire. 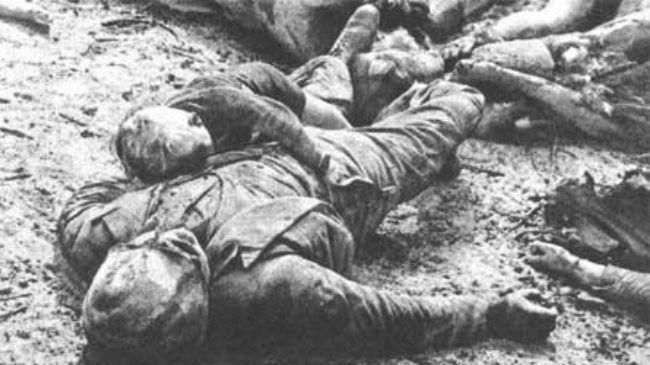 The deadliness of the resulting firestorm was such that even people who took shelter from bombs underground in cellars or subways were either roasted to death by the heat or suffocated, because the firestorm sucked the oxygen out of the air. Over ninety per cent of the centre of the medieval city – known as the Florence of the Elbe – was destroyed. The bombing of Dresden was an Anglo-American war crime never brought to trial. A war crime, by definition, is any crime that transgresses the laws of war, and the bombing of civilians has long been banned by international law. The 1923 Hague Rules of Aerial Warfare declared: “Aerial bombardment for the purpose of terrorizing the citizen population, of destroying or damaging private property not of military character, or of injuring non-combatants is prohibited.” Even the Hitler-loving British Prime Minister Neville Chamberlain declared in 1938: “It is against international law to bomb civilians as such.” In the same year, the League of Nations Assembly unanimously accepted similar principles. The fire-bombing of Dresden was considered to be a gratuitous crime on the part of the British which caused up to 300,000 deaths. When the last of the bombers departed, the open spaces on the banks of the Elbe were piled with the bodies of civilians who flocked to the river in search of escape from the heat and then drowned. The bodies of many others were glued to the surface of streets where the tarmac had melted and then solidified as the firestorm engulfed 11 square miles — an area much larger than that destroyed at Hamburg. About 75 per cent of all property was gutted completely as temperatures soared to around 1,000 degrees Centigrade. Why was Dresden selected for the February 1945 bombings? Dresden was directly in the path of the advancing Soviet Army, who occupied the city shortly after the raids on their way to Berlin (Dresden was soon to be part of the post-war Soviet Zone). 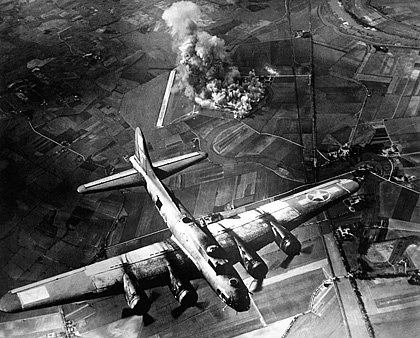 The idea was that the death and devastation caused by the bombing would be seen and reported back to Stalin, showing him the destructive capabilities of the U.S. and British bomber forces. With the end of the war only three months away, the aim of the Dresden raids was to try to intimidate Stalin and the Soviet Union so they would not stand up to the Anglo-American imperialists after the war. About three weeks after Dresden, another similarly coded message was sent to Stalin and the Soviet Union via the U.S. imperialists’ firebombing of Tokyo, which incinerated between 80,000 and 200,000 people. 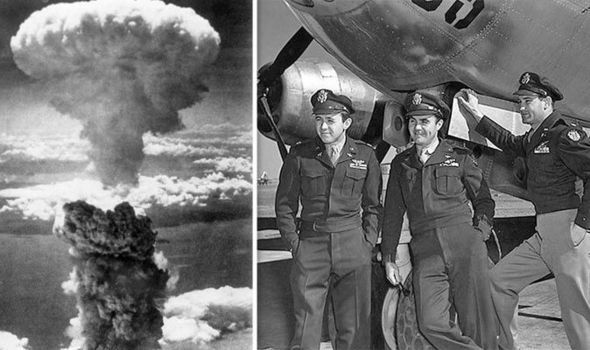 In August 1945, the U.S. imperialists sent two new messages, targeting Hiroshima and Nagasaki to showcase the destructive force of their new atomic bomb. 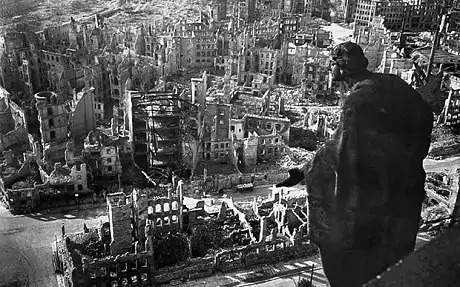 Just as Tokyo, Hiroshima, and Nagasaki had little or nothing to do with the war against the Japanese imperialists, Dresden had little or nothing to do with the war against the Nazis. But it had much, if not everything, to do with a new conflict in which the Nazis and the Japanese imperialists would be Anglo-American allies and the enemy would be the Soviet Union. The Cold War was born amid the ashes of the hundreds of thousands of non-combatants who were murdered in the deadly infernos of Dresden, Tokyo, Hiroshima and Nagasaki. In 2004 a commission of thirteen German historians mysteriously reduced this figure to the current official estimate of 25,000 deaths. 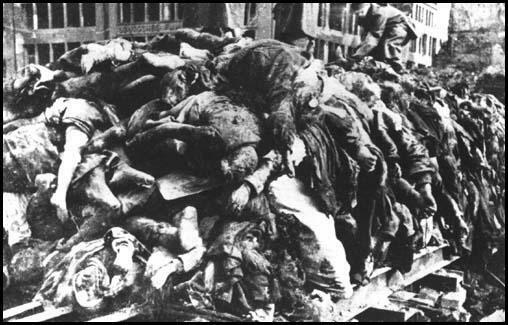 This deliberate reduction to downplay the number of deaths parallels the imperialist campaign to reduce the number of deaths attributed to the Nazis, e.g., the number of official deaths at Auschwitz-Birkenau concentration camp was recently reduced from the immediate post-war figure of 4 million, agreed upon at the Nuremberg Trials, to 1.4 million. The most ludicrous theory of the origin of the Dresden raids is that Winston Churchill, the virulent anti-communist who initiated the 21-country invasion of the fledgling Soviet Union in 1918 and who made the Goebbels-inspired Iron Curtain speech in 1946 that officially opened the Cold War, carried out the Dresden raids because Stalin ordered him to! Of course, no documentation of this so-called order exists. Andrew Chandler, “The Church of England and the Obliteration Bombing of Germany in the Second World War.” English Historical Review, 108 (1993), pp. 920-46 (p. 931). Similarly, the U.S. imperialists used white phosphorus and napalm weapons to terrorize and kill civilians during the Korean and Viet Nam wars. See, for example, Donald Bloxham, “Dresden as a War Crime,” in Paul Addison & Jeremy Crang (eds. ), Firestorm: The Bombing of Dresden, 1945. Chicago: Ivan Dee (2006). Adam Roberts & Richard Guelff, Documents on the Laws of War. Third Edition. Oxford University Press (2000), p. 22; Geoffrey Best, War and Law Since 1945. Oxford University Press (1997), p. 200. Good guys? What good guys? Regarding your Note 1, the reason for downgrading the extermination numbers for Auschwitz is not “Imperialist” at all. In fact, the “6 million Jews” narrative provides the foundation for much of the Globalist and Zionist activity since 1945, so it’s in the interests of the Imperialists to keep the total as high as possible. The real reason for reducing the number from 4 million to “about a million” is that subsequent evidence has shown that it was logistically impossible for 4 million people to have been exterminated at Auschwitz. One must remember that it was the Soviets that liberated the forced-labour camps in Poland and announced to the world that they has discovered evidence of large-scale genocide while refusing to allow anyone access to those camps to verify the reports. The first time that the words “six million Jews” were used was in a report in the New York Times on July 19 1921 which stated that, “Russia’s 6,000,000 Jews are facing extermination”. The phrase, “six million Jews” was published in the New York Times several times between 1921 and 1942 and it was finally cast in stone when one of the Nuremberg accused confessed that the Nazis had killed 6 million Jews, a piece of evidence that was obtained under torture and never corroborated by any hard evidence at the Nuremberg Trials or at any time since. So, while the Nazis most certainly did kill Jews between 1942 and 1944, six million is an unlikely total.